The term Diaspora is used to refer to any people or ethnic population who left their traditional homeland. The Basque Diaspora consists of people living outside the Basque homeland in Europe who identify as being Basque. 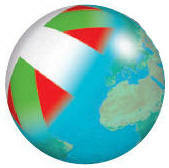 There are now over 170 Basque organizations in 24 countries around the world. While historical references to the formation of Basque associations outside the Basque country date from the 17th (Lima, Peru) and 18th (Madrid & Mexico) centuries, the real expansion of the global Basque Diaspora is only over the last century. Several hundred voluntary associations have formed in about two dozen countries around the world. Estimates vary (one is seven million) but there are now more people of Basque descent living outside than in Euskal Herria (Basque homeland in Europe where three million people live). The North American Basque Organizations (a.k.a. N.A.B.O.) was founded decades ago with the intent of helping its member organizations to help each other in the pursuit of the same objective: the perpetuation of "Basqueness" (Basque culture and identity). NABO promotes expanding communication networks with our fellow Basques for practical and pleasing reasons: practical because now with the world of the Internet new opportunities are afforded us to learn from one another as we encounter many of the same challenges in sustaining "Basqueness." There is also a personal benefit because of the gratification derived from meeting others of a like-minded commitment to sustaining Basqueness. To the extent that NABO has found success it has been based on multi-directional communication among our various member organizations; note that NABO is only a federation and its strength derives from what our member organizations provide. Whereas the meaning of Basqueness has changed over time (e.g., at one time Basques were predominately rural whereas they are now urbanites) one constant has been their language Euskara--Europe's oldest language. It is a language unrelated to its Indo-European neighbors that were all introduced after the Basques were situated in their homeland. For example, when the Romans arrived 2,000 years ago speaking Latin that later spawned Romance languages (i.e., Spanish, French, Italian, Portuguese & Romanian) they found a people inhabiting this corner of Europe speaking a language all their own. Basques have been around for a long time as a self-defined community, and this cultural trait seems to have clearly animated Basque migrants who went about creating Basque associations where-ever they went. The term diaspora (in Ancient Greek, διασπορά – "a scattering or sowing of seeds") is used to refer to any people or ethnic population who are forced or induced to leave their traditional homeland. Over the last five centuries, Basques migrated for many reasons including political and economic hardships. This webpage provides some general information about this global community that maintains Basqueness in the Euspora. Then again, being Basque is largely a state of mind--these days one decides to what degree s/he chooses to define as being Basque. Here are some related websites; please send along your link recommendations, and we hope you enjoy our Euspora portal. Euskal Herria, or the Basque Country, is a region situated at the border between France and Spain on the western Pyrenees. It holds a total combined population of nearly three million people — yet, surprisingly, they are the minority of the Basques worldwide. The total size of the worldwide Basque population is especially difficult to determine, as there are many ways to define 'being Basque' (e.g. by birth, by ancestry, by ability to speak the Basque language etc.). Nevertheless, the most reliable estimates figure the population at around 4.5 million people. This now means that there are 1.5 times more Basques outside of the homeland than there are within it. Diasporas like the Basques are composed of migrants who share a collective identity in their homeland and have left by choice or by force, often a result of structural socio-economic or political conditions. In their new homes, these migrants and their descendants maintain and develop cultural, religious and political expressions of identity. Collectively, they develop an identity distinct from—yet tied to—the dominant culture of their homeland. This separation, both physical and psychological, makes a diaspora more vulnerable to cultural erosion and evokes varying degrees of nostalgia and longing. Issues of communication and contact—and the technologies that support them—become acutely important. They hold the potential to reduce not only physical distance, but also the emotional distance between migrant diaspora communities and the homeland.